On this Earth Day, we need your support more than ever! Most years we celebrate the first colors and warming days of April as promises of the coming spring weather. However, chilling political winds from Washington threaten hard won environmental victories over the past 50 years, dimming our springtime hopes and turning this year’s Earth Day celebration into a day of protest. Now more than ever, the work of the New Jersey Highlands Coalition is critically important! The first Earth Day, celebrated in 1970, was the brainchild of Senator Gaylord Nelson in response to damage caused by a massive oil spill off the coast of Santa Barbara, CA in 1969. Twenty million people throughout the US participated in rallies and protests that day, voicing concern about the effects of pollution and the degradation of our natural resources. That first celebration had far reaching impacts, planting the seeds that led to the creation of the USEPA and the passage of many environmental laws, including the Clean Air Act, the Water Quality Improvement Act and the Endangered Species Act, to name a few. Here in New Jersey, inspired governors, in concert with legislators and an engaged public, passed innovative laws such as the Pinelands Protection Act, the Wetlands Protection Act and the Highlands Water Protection and Planning Act. Policy Director Elliott Ruga at Highlands Septic Density press conference at Liberty State Park. Now, however, barbarians are at the gate with a well-funded, national effort to exploit our natural heritage and poison our air and water, using the false promises of jobs, economic growth and energy independence, making the underlying greed of the narrow interests that will solely benefit. As the new President decimates the Environmental Protection Agency, our outgoing Governor continues to weaken or eliminate necessary regulations, and the environmental agencies and commissions that enforce them. All that stands between you and a return to unbridled development is the New Jersey Highlands Coalition and the dedicated work of its 97 member organizations. We cannot do it alone! We are only as effective as the support you provide us. 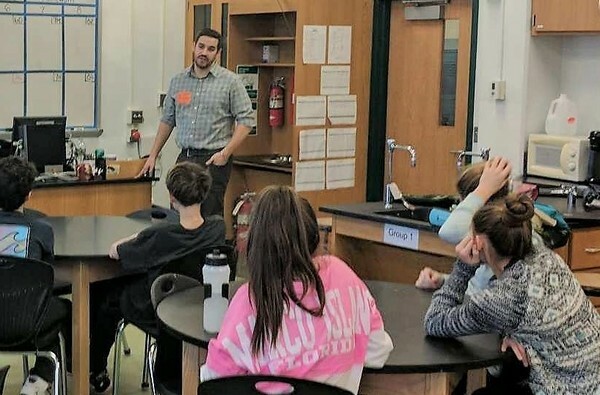 Outreach and Education Director Sean Gilson discussing the Highlands with elementary school students in Spring Lake. The demands on our small, agile staff are escalating rapidly. We need your support to strengthen the programs that broaden our reach and effectiveness. With your additional support our Highlands Advocates Program—which trains members to be effective advocates within their Highlands communities—can reach its full potential. We need to increase funding for our Small Grants Program, to further promote grassroots activism that protects Highlands resources. Earlier this month we produced our first ever Water Resources and the NJ Highlands Conference in partnership with Montclair State University, where advocates, legislators, scientists and academics came together to correlate the values of Highlands natural resources with our health, well-being and economic stability. Also in April, we joined with a dozen other advocacy groups for two full days of meetings with the entire New Jersey congressional delegation on Capitol Hill, to urge them to stand against the Trump environmental agenda. 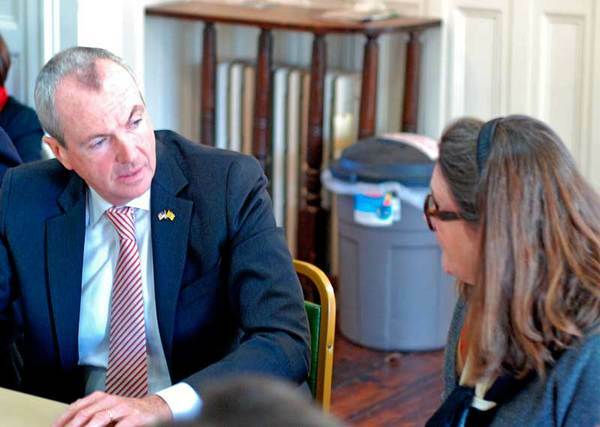 Executive Director Julia Somers discussing Highlands issues with gubernatorial candidate Phil Murphy at a recent Policy Committee meeting. 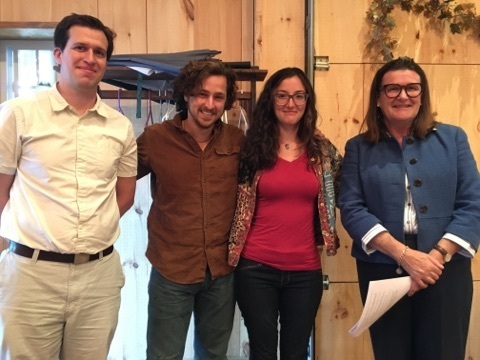 Grassroots groups, Friends of the Musconetcong River and MEVO, receive Small Grants awards at this year's Annual Meeting. In addition, we continue to participate at every Highlands Council and Highlands Development Credit Bank Board meeting. We are also continuing to encourage municipal conformance to the Highlands Regional Master Plan, and opposing inappropriate development proposals in Hampton Borough, Oakland Borough, Bloomingdale Borough and elsewhere in the Highlands. We are helping local groups oppose Forest Stewardship Plans with overly aggressive logging schemes on public lands on Sparta Mountain and elsewhere. We have partnered with other organizations in the Delaware River Watershed Initiative to execute projects, including our own Lopatcong Creek Initiative, to restore water quality in the Highlands watersheds that are part of the Delaware River basin. It is your special contribution now that will allow us to expand our advocacy and outreach programs. And with great pledges from three Coalition members to match your contribution, there is no better time to give than now! Earth Day must return to being a celebration of progress. It is a biological imperative that we have clean water to drink. Water is essential for life and must not be bartered away for short term gains enjoyed by a few. Please stand with us, make an Earth Day donation today, and take advantage of a generous match! PS: Water is vital to all life—and the Highlands is the largest single source of clean water in New Jersey. 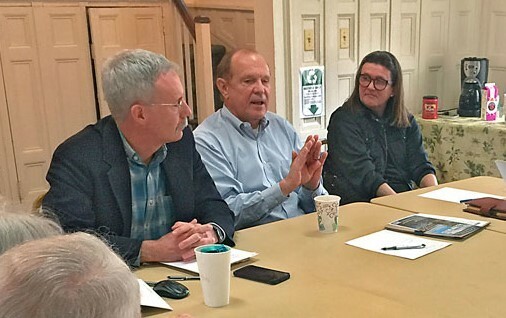 Gubernatorial candidate Senator Ray Lesniak listens to Coalition members voice concerns about the Highlands at a recent Policy Committee Meeting.